*Please note- This is a BUNDLE for all of the weeks of my Spelling and Phonics Tests for Unit 6. 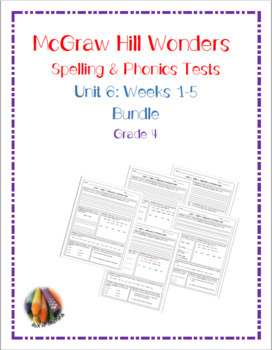 WONDERING if there is a quick & easy way to assess your students on Spelling & Phonics in McGraw Hill Wonders? Well, wonder no more! I have just what you are looking for. I created these tests because I was tired of my students just memorizing a list of words for the week, and then spelling those same words wrong later in their writing during the year. Ugh! Plus, trying to find Phonics tests that matched what I was teaching, was near impossible! Double Ugh! If you are tired of the same things, then you need these assessments! These assessments will not only save you time on trying to find tests, but it will give you multiple Spelling & Phonics grades for the Common Core Standards. Best of all, it assesses the students the way they use the words in their spelling, phonics & writing. Not on whether or not they can memorize a list of words for a few weeks. As a bonus...it also prepares them for the State Testing at the end of the year by testing them in the same way they are assessed on the test! These Assessments use the Spelling Words & Phonics Skills found in your Wonders Teacher's Manual. They include the Common Core Standards that the students are assessed on. So, all you need to do is teach the lessons and then give the tests. It's that easy! I even included an answer sheet for you. The assessments include: Spelling: Dictation, Proofreading, and Word Meanings, and Phonics. So what are you waiting for! Go ahead and download the assessment and see how much better your students will do on their spelling, phonics and writing! This BUNDLE includes assessments for all 5 weeks of the Unit. If you like my product... please follow me and watch for more Units of Wonders Grade 4: Spelling & Phonics Assessments coming soon.